The Tale of Sir Bob: A More Sensible Approach to Journalism? A More Sensible Approach to Journalism? On Monday, the Guardian presented their new angle on journalism. Every day, they will publish a newslist including upcoming articles, events and speeches and the twitter page of the journalist in charge of that particular element. The new system is an experiment meant to last for a fortnight but which might become a permanent fixture. The idea is not only to provide insight into the inner life of the newspaper but also to preempt complains after publication. Readers will be able to tell the journalist about what to include or not include and even point out stories the newspaper might want to cover. This system is based on the paper's earlier, positive experiences with twitter. Of course, not all stories will figure in the list. Some, which the paper might want to keep exclusive or which need to be kept unpublished due to source concerns, will be kept from the list. The national news editor of the Guardian, Dan Roberts, said that the risk of news leakage to competitors would be far outweighed by the benefits of reader opinion. The scheme is known to have worked well in newspapers such as The Atlantic Wire and the Swedish Norran. Hopefully, this makes for the open, more transparent form of journalism needed after the News of the World debacle. 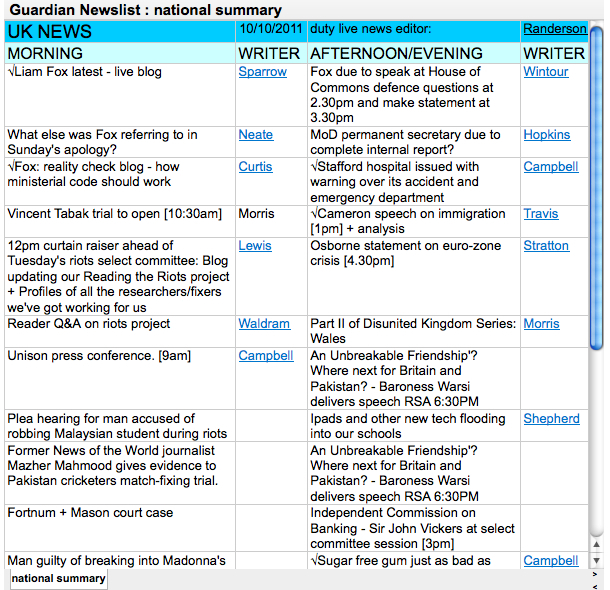 To visit the Guardian's newslist, click here. Sources: The Guardian Online, last visited 12.10.2011, Pic.